Fun fabrics and sweet silhouettes are a highlight of the Jenny by Jenny Yoo Wedding Dress Collection for Fall 2018! 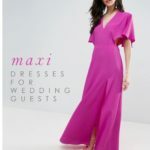 If you’ve been following along with our coverage of the Jenny Yoo Bridal and Bridesmaid Collections, you’ll know that I have recently shown you the beautiful Spring 2019 Jenny Yoo Bridesmaid Collection and Jenny Yoo Collection wedding dresses for Spring 2019 . 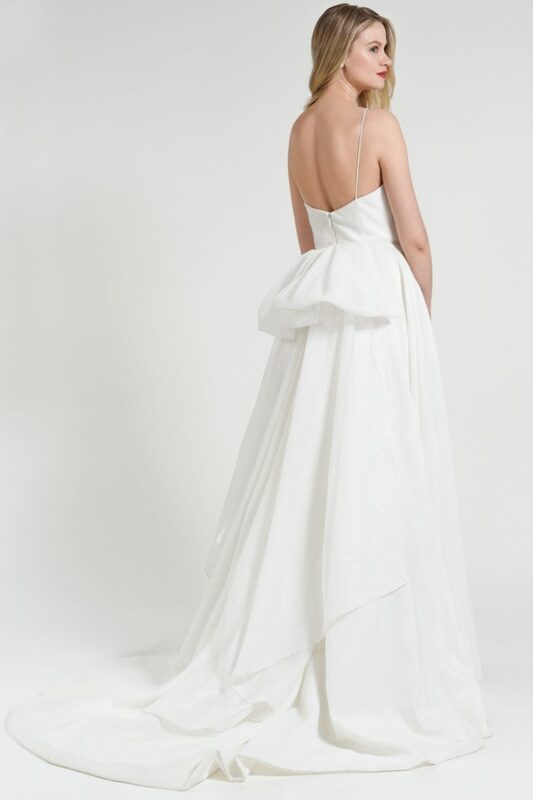 Today, I was about show you Jenny by Jenny Yoo Wedding Dresses for Spring 2019 — and I still will! 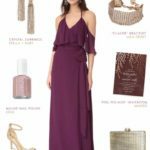 However, as I started writing the 2019 post, I quickly I realized I had never shown the Jenny by Jenny Yoo Fall 2018 collection, which was shown in 2018, but is available now in boutiques! 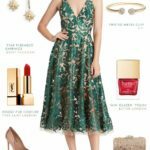 So that’s what I have for you today – the Fall 2018 Jenny by Jenny Yoo Collection! 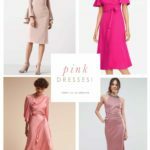 This collection not one to be missed, as it introduces some beautiful new silhouettes and fantastic fabrics. 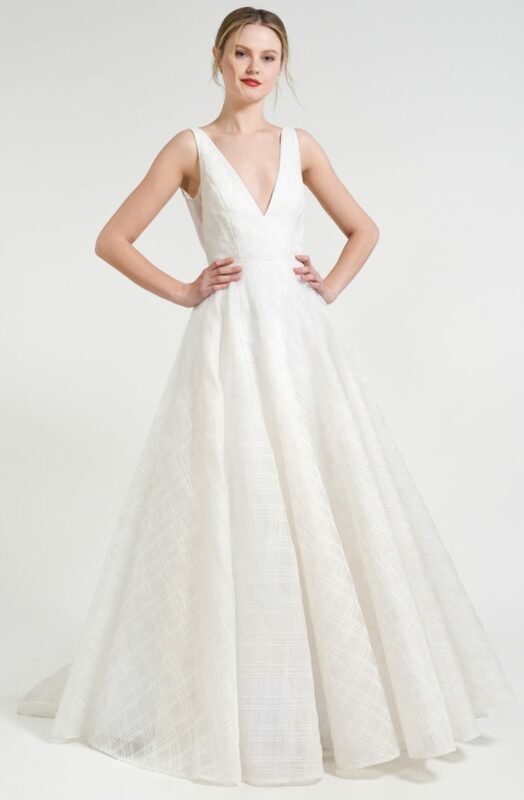 As a subtle pattern lover, I’m especially entranced with the plaid organza in the Avery and striped organza fabrics in the Wallace and Piper gowns. Delightful details fantastic open backs, sheer side details, perfectly placed floral applique, and pockets –my all-time favorite wedding dress option! 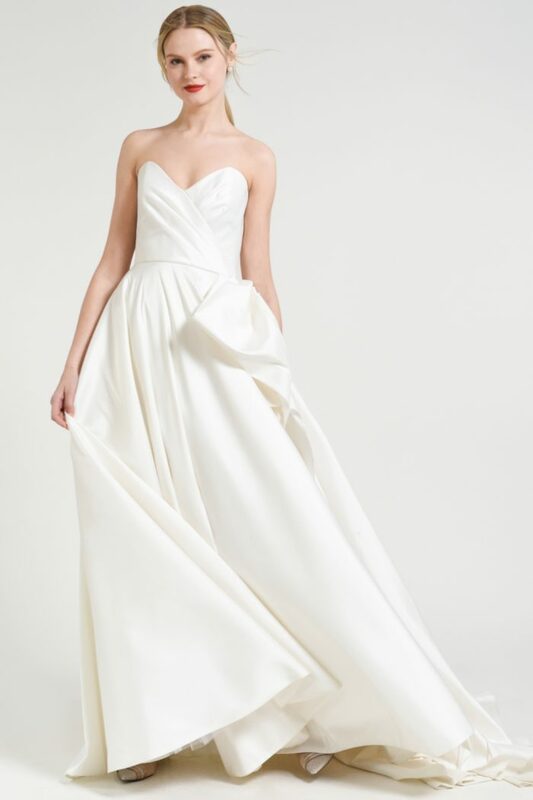 Spencer, seen here, is one of the many stand-out gowns from the Fall 2018 Jenny by Jenny Yoo Collection. A beautiful plaid organza A line bridal gown! 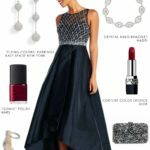 A sleek crepe gown with fit and flare silhouette and a deep plunging neck. Blythe features long fitted sleeves and a diamond-shaped open back with tulle mesh detail. Charlotte is a classic ballgown done in luxe taffeta, with a romantic pleated sweetheart neckline and a deconstructed bow accent. 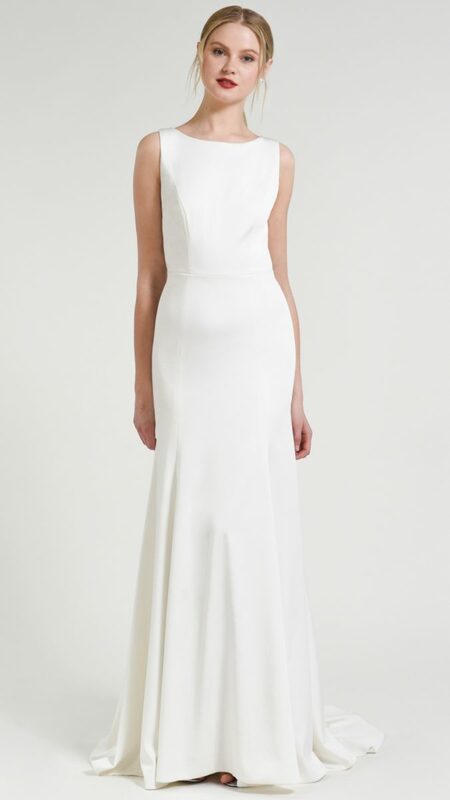 A classic boat neck bridal gown created in a figure flattering crepe. 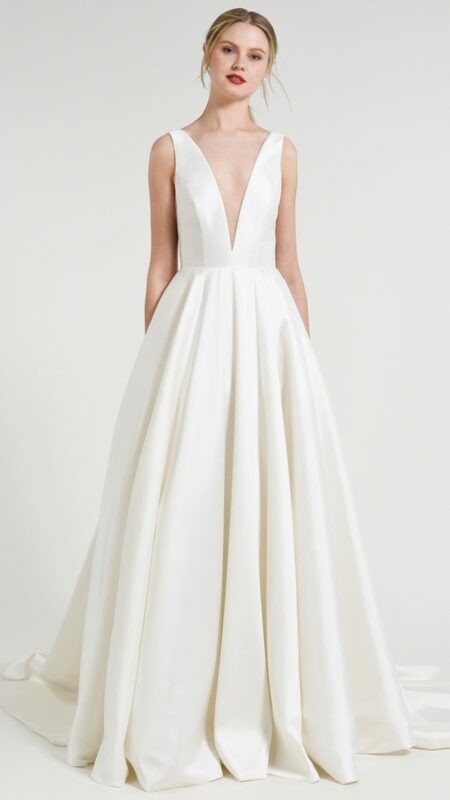 This modern fit and flare gowns as sleek lines front and back, which pull focus to the elegant diamond-shaped open back cutout detail. The finishing touch is a long, elegant train. 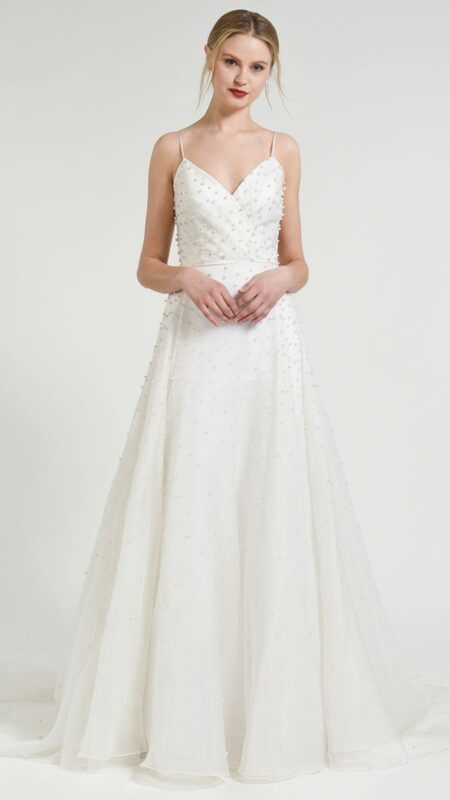 Odette is a strapless A-line wedding dress with delightful handbeaded floral details and pockets! Piper has stripes! 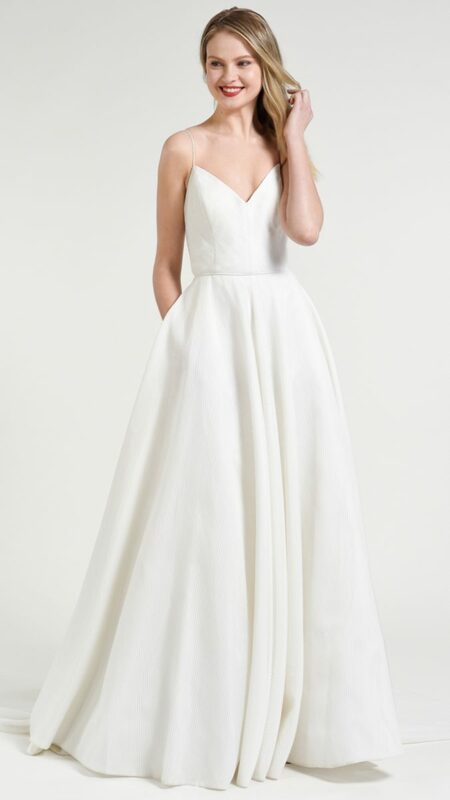 This modern and spirited spaghetti strap soft V neck wedding gown has been created in a special striped organza fabric. 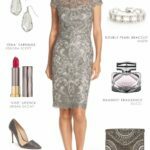 The full skirt gives volume that contrasts to the fitted bodice. The back features an innovative train overlay that can be bustled. Presley is an A line ball gown wedding dress with pearl detailsand delicate straps. Spencer is a dramatic and modern V-neck circle cut ball gown taffeta wedding dress. The delightful detail of the illusion tulle side panel insert adds a modern look while drawing attention to side pockets. Wallace softly pleated romantic ball gown wedding dress in a delicate striped organza fabric. 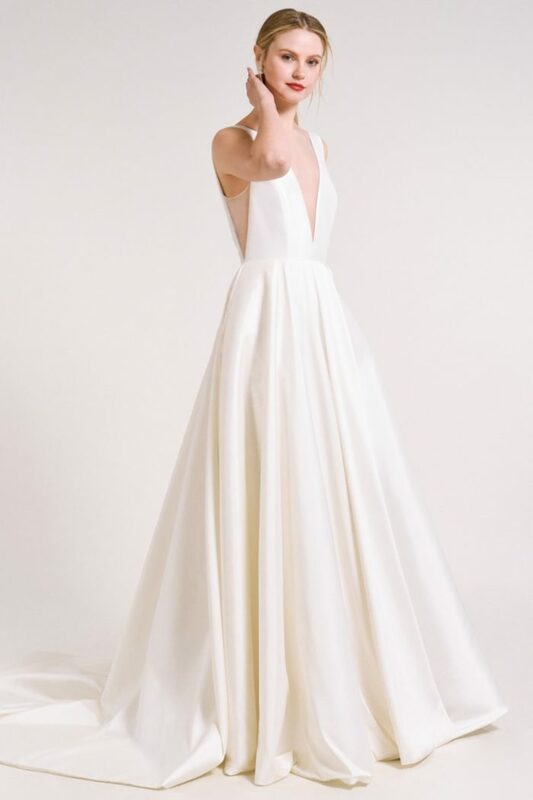 The Jenny by Jenny Yoo Collection reflects the modern bridal style we have come to love from the design house of Jenny Yoo, at prices of under $1,600, to make the signature Jenny Yoo wedding dress available in an attainable price range. 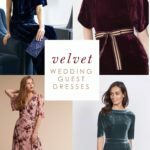 For more information on any of these Jenny by Jenny Yoo Fall 2018 wedding dresses, visit jennyyoo.com and their boutique finder page. This portion of this otherwise non-sponsored post uses affiliate links, which means this site may earn a commission if you make a purchase. 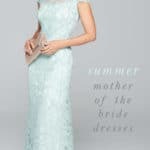 Selected Jenny by Jenny Yoo and Jenny Yoo gowns are also available at Nordstrom and at BHLDN. You can shop those store selections here, or visit jennyyoo.com for more purchasing information!